The ultimate reality of God and Existence is beyond words and thoughts. One can use words to the extent feasible to communicate about one’s spiritual beliefs. But becoming obsessed with particular words is not useful. Words which are used to describe the nature of reality and the truth of oneness are historically embedded and culturally conditioned. Hinduism has many gods. There are many different symbols and images to describe God. From the outside, it looks strange to people. So many gods! How confusing. Will the real God please stand up?! Actually, it is not confusing at all. Underlying it all, we know, it is the same thing. Same Reality. Same Truth. The mystical experience of Enlightenment is not one of communication but one of communion with the highest Divine. God is Spirit and has no name. That is why it can be called by many names. There is no point in fighting over which words are the best to describe God. God has no name except in our imaginations. Whatever name we give God with reverence, God graciously enters into it and enlivens it. So for us, that becomes God’s name. For someone else, God may have a different name. That is all right, is it not? Although in different languages Love is called by various names, it does not change the essential nature of Love. Lovers know what love is. Just ask them. In every religion, culture, and in any historical time period, Love is felt. Same with God. Names may be different but the experience and feeling of those who experience God is the same. In Sanskrit, the term Jnani or Gyani (in Punjabi) denotes a saint who knows God intimately. His/Her personal existence has become fundamentally and inseparably rooted in God’s Existence. For such a person God reveals the nature of existence from within and shines brightly as pure being, the Universal Heart. From a practical standpoint, a man or woman of God does not look any different or behave any different than anyone else. The vedas say, the sages see the same reality everywhere. It is the Reality of God as one’s own Heart underlying all physical, psychological, and spiritual phenomena. Spiritual methods and techniques of meditation and pranayama are all phenomena. Their ultimate utility exists only in purifying the mind and facilitating the mind to subside into the Universal Heart, that is pure Awareness, One Whole. The Hindu scriptures simply refer to the Heart as Sat-Chit-Ananda. Existence, Consciousness, Bliss, all as One Whole. When the mind that is the witness of phenomena surrenders itself fully without fear and reservation to the Lord, then it merges in the Heart. It is now that the Self is known as the Eternal Presence that has never been absent. There is a statement in Christianity which says that Man is made in the image of God. In the philosophy of Advaita, God, the ultimate Reality is pure awareness. Man also has the same quality of awareness but it is conditioned by samskaras (mental conditioning). Even now we are awareness, although it is manifesting through the conditioned mind, and the Ananda (Bliss) aspect and Eternal part is not clear and visible. Holding on to this thread of awareness, with the help of whatever method comes natural, the mind subsides and the Self manifests as Awareness ItSelf. The French philosopher Pascal once said something like the “Heart has its reasons that mind cannot know”. So we should not worry too much about our path. The Heart has its reasons that we cannot fathom. We just have to take one step at a time. God is nowhere else other than in one’s own Heart at the core of one’s existence. One’s own Heart shows the path. Finally one sees and knows as the Heart. In this state, Seeing Is Being. One Is the Heart whose nature is Self-Awareness, Self-Bliss, Self-Knowledge, Self-Eternity, Self-Wholeness all as One. What name can God have? Who is there to give God a name? Editor’s Note: The featured picture is from brother in Bhagavan Eden Kailash on Facebook. This is so perfect for today, really any day, but especially in times of chaos we don’t need our understanding of God to come between us. Thank you Harsh for your clarity and kindness. You timing is awesome, thanks. The mind has been fussing over meanless theory for days bringing dark clouds closer and closer. This shut thing down nicely. 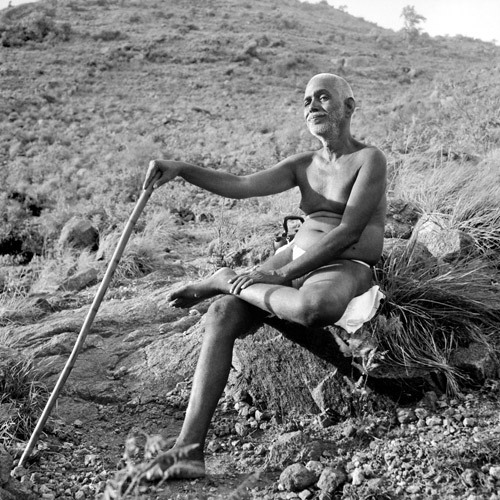 Ramana Maharshi: “I am” is the name of God. Of all the definitions of God, none is indeed so well put as the Biblical statement “I am that I am” in Exodus. Thanks for a perfect post, Harsh! Takes my breath away. Truth does that. Beautifully expressed. Thank you so much.